No record has been found for the earliest date the flag was flown over the east and west central fronts of the Capitol. Early engravings and lithographs in the office of the Architect of the Capitol show flags flying on either side of the original low dome above the corridors connecting the areas now known as National Statuary Hall and the Old Senate Chamber. After the addition of the new House and Senate wings in the 1850s, even before the great dome was completed in 1866, photographs show flags flying over each new wing and the central east and west fronts. An appropriation to provide flags for the east and west fronts was made in the Sundry Civil Appropriations Act [28 Stat. 393], approved August 18, 1894, as follows: "To provide flags for the east and west fronts of the center of the Capitol, to be hoisted daily under the direction of the Capitol Police board, $100, or so much thereof as may be necessary." The custom of flying the flags 24 hours a day over the east and west fronts was begun during World War I. Requests were received from all over the country urging that the flag of the United States be flown continuously over the public buildings in Washington, D.C. 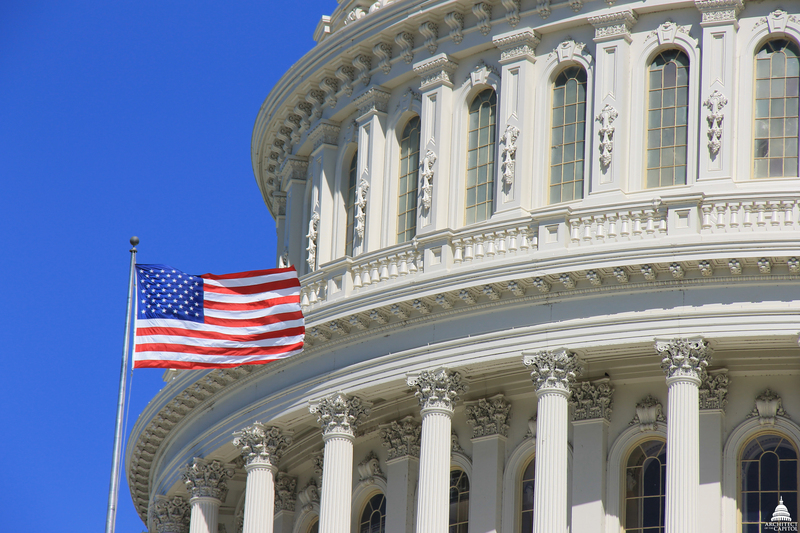 Authorities in charge of the Capitol consider it a fitting mark of respect that our flag be kept flying at all times over the United States Capitol. The east and west front flags, which are 8 by 12 feet, are replaced by new ones when they are no longer fitting emblems for display.